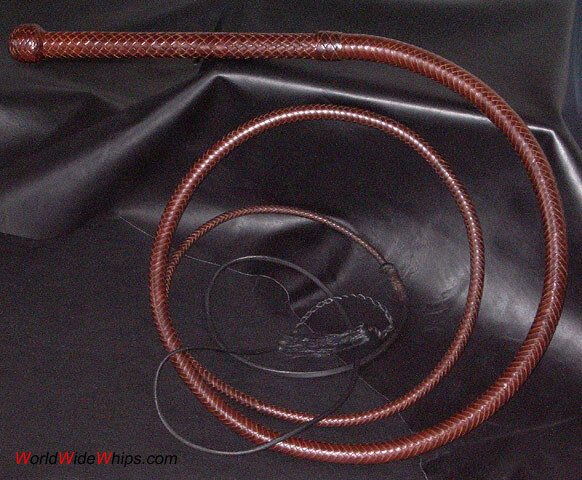 This bullwhip is custom made by Mike Murphy. It is a modification of his Australian Pattern Bullwhip with increased diameter, 16plt downto 8plt. The handle is about 1 in. (24mm) wide, instead of 20mm. All dimensions are carefully adapted, including the size of fall and cracker.Mike chose a very thick hide for this whip. Despite its thickness, the whip is very elegant and fluid. Image 2 and 3 show the whip compared to a standard Australian Pattern (see Australian Pattern Bullwhip (6ft) by Mike Murphy).